Please bring either a hot entree or salad and dessert with serving utensils as needed. Drinks, cups, plates, and utensils will be provided. Team awards will follow the meal. District Qualifiers Have Been Posted. Due to thunderstorms, the coaches meet was suspended before we finished. We will conclude at ELCO high school on Tuesday may 15th at 5:30 pm. A bus will leave from the west Gym at 3:15. Only athletes that run the following events must attend. 400 m dash, 4×100 relays, 800 meter dash, and 4×400 meter relays! See you all Tuesday! 12:o0 pm to 4:00 pm at Boas (across from Frey’s Greenhouse) or 4:30- 5:00 pm at the Track. Thank you for all of you who participated and contributed to making our sub fundraiser a success. A special thank you to Mara Braegelmann for organizing and running the fundraiser. Attention all Track and Field Athletes, Please click on the link below and complete the end-of-season athlete survey. 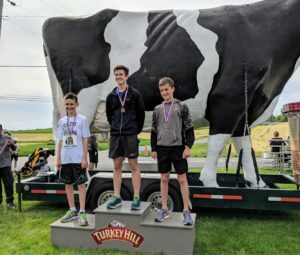 This morning three of our junior high runners competed in the turkey hill classic 5k! Aaron Harnish(left) and Isaac Braegelman(right) finished 15th and 11th overall in a field of over 300. They also finished 3rd and 2nd overall in the 18 and under category! Not pictured is Grace Ritchey who finished 2nd overall in the women’s under 18 category!!! Go Comets!!! Due to a long meet today, and the spring fling on Friday. Junior high practice will be canceled on Friday may 4th! Enjoy the long weekend, see you all on Monday! May the 4th be with you! Varsity track and field athletes not competing at the Blue Streak Invitational this Saturday (May 5th) or who have not qualified for LL Leagues, please turn in your CLEAN uniform tomorrow, Wed. May 2nd 2018 at 3:15 pm. If you are unsure if you are competing in Blue Streaks or LL Leagues, please check with your event coach.